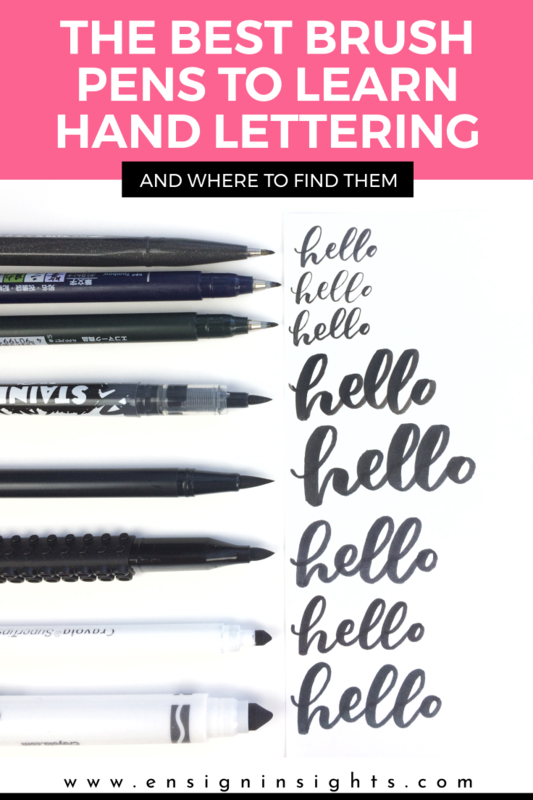 One of the questions I get asked the most is, “What pens should I start with as a beginner?” When I first started hand lettering, I had no idea that there were so many different types of brush pens out there! My biggest suggestion to everyone is to try ALL the pens. Not only because it’s fun, but also because you may like a certain pen that someone else doesn’t like depending on your style. I will review my favorites here, but you get to try them all for yourself. Pentel Touch Brush pens are very similar to the Tombow Fude soft nib. The soft nib makes it easier to get thicker down strokes and it’s still easy to control the upstrokes. It comes in 12 colors so you’re not only stuck to only black. These are small nibs so it doesn’t work well for larger designs. You can get these individually at Michaels, but I haven’t seen the pack of 12 colors there. But you can find them on Amazon or at jetpens.com. You can also find the 12 color pack at Target! It’s not as inexpensive as Amazon, but it’s Target. The Tombow Fude hard nib was my very first REAL brush pen (after Crayolas which aren’t technically brush pens). I used to love this pen more than the soft nib, but now I like both depending on my mood. The hard nib makes it easier to get the thin hairline upstrokes. But you can’t get as thick of downstrokes as the soft nib. It looks a little more precise than the soft nib if that’s the style you’re going for. They only come in black and they are for smaller desins. You can find these on Amazon or also find these at jetpens.com. I’ve also been seeing these at Hobby Lobby lately. The price is comparable to Amazon when you use the coupon. Most beginners prefer the Tombow Fude soft nib over the hard nib in the beginning. I would suggest getting one of each to see what you prefer. I would describe these to be the same as the Pentel Touch brush pens but they only come in black. You can also find Tombow Fudenosuke soft nib on Amazon, Hobby Lobby, and Jetpens. Sharpie Stained Brush markers are actually fabric markers but I’ve never even used them on fabric. They are really juicy and hold a lot of ink so they can bleed through some papers. The nib is very bendy but bounces back really well. They come in neon colors but I mostly use black. These are a medium nib but the nib is so flexible so you can letter medium or large designs. These are so satisfying to letter with! Sometimes Hobby Lobby has these individually or you can find them on Amazon in a pack with all the colors. Tombow Dual Brush pens are some of the most popular brush pens and for good reason. They come in 96 colors and you can get smaller packs of certain color palettes. The nib is longer so it does take some practice to get used to. They blend beautifully and work great for watercolor. They have a fine point in a matching color. I have found that I actually use the fine nib more often than the brush tip. There are many places to find these. Amazon is great, my favorite pack is the bright set. You can buy the individual colors at Michaels or Blick. You can find different color packs at Hobby Lobby. I have a whole post dedicated to Artline Stix Brush markers here. These were the first large brush pens I fell in love with. They come in 20 colors. The nib is a medium nib so it is a little easier to control than Tombow Dual Brush pens. If you struggle with Tombows, I would suggest trying these to practice with. They blend well and give a natural, faint ombre look. Artline Stix can be hard to find in the US but Amazon has been pretty consistent with keeping them in stock lately. Some people have liked Crayola Supertips better than the broadlines as beginners. I liked the broadlines personally. But they’re so inexpensive that there’s no harm in trying both! I love that there are so many colors. Since the supertips have a smaller nib, you can get smaller designs. But the contrast between the thick and thin strokes isn’t as big as it is with the broadline. You can find these almost anywhere including Walmart. Here they are on Amazon. Crayola broadline are my favorite brush pens for beginners. They’re still my favorite and I’m not a beginner anymore. I love that they’re so easy and inexpensive to get. You can put different amounts of pressure on the nib to get varying thicknesses and you can still get really thin upstrokes. They come in lots of colors and blend easily. 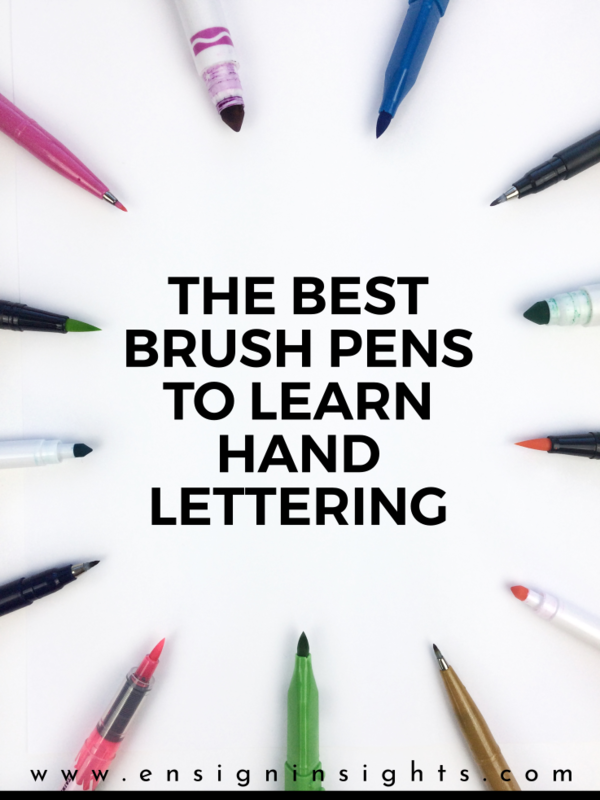 They do have a different feel from actual brush pens, but they are great practice before you are ready to spend more money. Once again, you can find Crayola broadlines almost anywhere including Amazon. 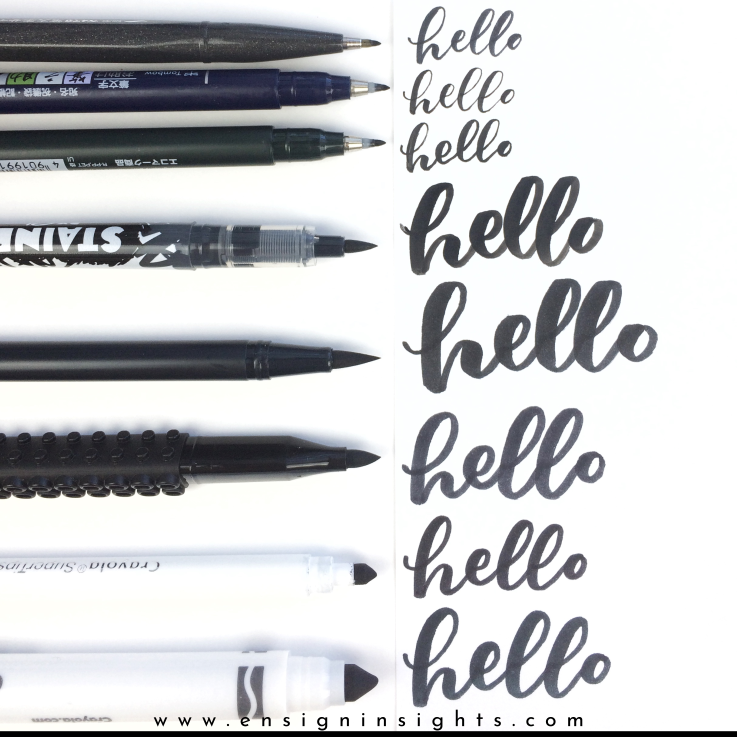 Watch my video above to see these brush markers in action. Sakura Micron Pens (These are perfect with watercolors because they are waterproof so they don’t bleed. You can find them at all art stores and Amazon. Like I said in the beginning, there are so many brush pens out there! What other pens should be added to this list? What are your favorites?